Posted on March 27, 2013 by Eric Bonnici wrote in Burgers, Featured Fish and Chips, Featured Leamington and Pelee Island Restaurants, Fish and Chips, Ice Cream Parlors, Leamington and Pelee Island Restaurants. It has 3 Comments. 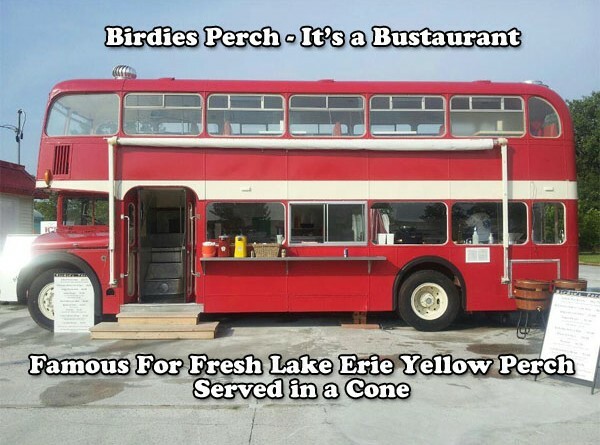 Birdie’s Perch is a restaurant located at Leamington’s Pelee Station just minutes away from Point Pelee National Park. This charming establishment is Windsor Essex’s first “Bustaurant”. That’s because it’s housed inside a 1965 Bristol Lodekka double-decker bus from the United Kingdom. The kitchen is situated downstairs and customers can dine on the outdoor patio or upstairs on the bus. The tasty food is made fresh daily and most ingredients are sourced locally from Ontario and Essex County. Enjoy Birdies Perch’s popular Yellow Perch Cone & Fries, with 5 pieces of Lake Erie’s freshest yellow perch lightly battered and deep fried, hand-cut fries, North Carolina coleslaw and Birdie’s signature garlic sauce. Perch is also served on fresh ciabatta buns sourced from nearby Lakeside Bakery, on corn taco shells, or on their own. You can even order individual battered perch fillets for a snack. There\’s something charming about enjoying perch while overlooking a scenic view of Lake Erie where the fish come from. If you’re lucky enough to score a table atop the bustaurant the view of Lake Erie is even better. In addition, the fantastic burgers are made with fresh local black angus beef from the Wild Acre Cattle Company farm and butcher shop in nearby Woodslee. This tasty beef is naturally fed, with no hormones or steroids. The menu also includes fresh hand-cut french fries, poutine, and back bacon on a bun. There’s even the Green Goddess Wrap to delight vegetarian and vegans that features artichoke and spinach sauce wrapped with feta, Leamington tomatoes, cucumbers, and lettuce. To quench your thirst, a variety of hot and ice cold drinks, such as Algonquin Iced Tea and fresh-brewed Pelee Blend coffee are served too. For dessert enjoy a treat from the Sweet Friendship Ice Cream Shop located next to and operated by Birdies Perch. Frozen yogurt and Kawartha Dairy ice cream, made with fresh milk supplied daily by Ontario dairy farms, are cool tasty treats to enjoy on a hot day. Tourists and locals alike often make it a point to stop by Pelee Station, after visiting Point Pelee, enjoying the numerous outdoor activities the area has to offer, or visiting local attractions like Essex County wineries or Colasanti’s, to enjoy the fantastic roadside fare Birdies Perch has to offer. Did you hear? Birdie’s Perch is set to re-open for the season April 12. It’s a bustaurant… a restaurant housed inside a Double Decker bus from the U.K. located in Leamington. They’re quickly becoming famous for serving fresh Lake Erie Yellow Perch in a cone and using local ingredients in their menu items. Did you try them out when they first opened last season? If so tells us what you think, we’d love to hear. I’ve been there and loved it!! Can’t wait! We are excited to try them out… what did you order Christine?